A piece of a three-dimensional bone structure from patient stem cells. Perfecting processes for regenerating body parts is no mean feat, technically speaking. Plus, there are ethical questions to resolve and regulatory hurdles to overcome. In other words, it’ll take a while before new parts are available. Nonetheless, investors are interested in the field, and especially in companies working with stem cells. 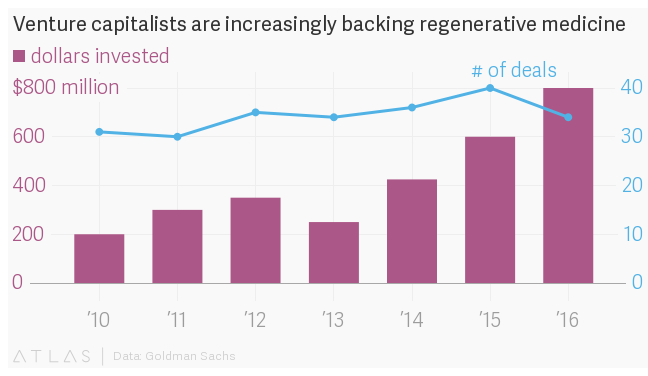 Goldman analysts believe regenerative medicine is attractive because of ”its vast potential” to eventually cure common and rare diseases in almost any tissue or organ, including the heart, liver, and lungs. So, money’s going to regenerative medicine, at a rate of hundreds of millions of dollars annually. In 2010, the field attracted about $200 million in venture capital and in 2016, that figure had quadrupled. Stem cell technology attracts the vast majority of investment; $700 million of the $800 million dedicated to regenerative medicine in 2016 went to stem cell projects. But analysts noted that the number of deals hasn’t increased accordingly. Between 2010 and 2016 deals remained in a range of 30 to 40 while investment rose pretty steadily. This suggests that a few companies attracted larger investments per deal over time from venture capital firms. Companies partnered with science giants—like BlueRock Therapeutics, which works with stem cell pioneer and Nobel laureate Shinya Yamanaka of Kyoto University—get the largest investments and valuations, according to Goldman Sachs. Analysts also remarked on Unity Biotechnology, which is developing a technique to eliminate senescent cells—or expiring cells—to increase longevity and maintain youthfulness, and has been shown to work in mice. Senescence is like a biological “emergency brake” cells use to stop dividing and multiplying out of control. But after the brake’s been pulled, the senescent cells remain and accumulate, secreting inflammatory molecules that harm neighboring cells and tissues. Selectively removing them could keep people younger, healthier longer, according to the company.